The authors remind us that 2014/2015 sees the compulsory teaching across two consecutive key stages for the first time since 2004. ‘It is clear that issues occurring at one particular key stage are rarely isolated and frequently have a knock on effect on another key stage…’ This is of course true in our experience, isn’t it? Four major themes are presented for our consideration in the conclusion. 1. The status of primary languages, 2. 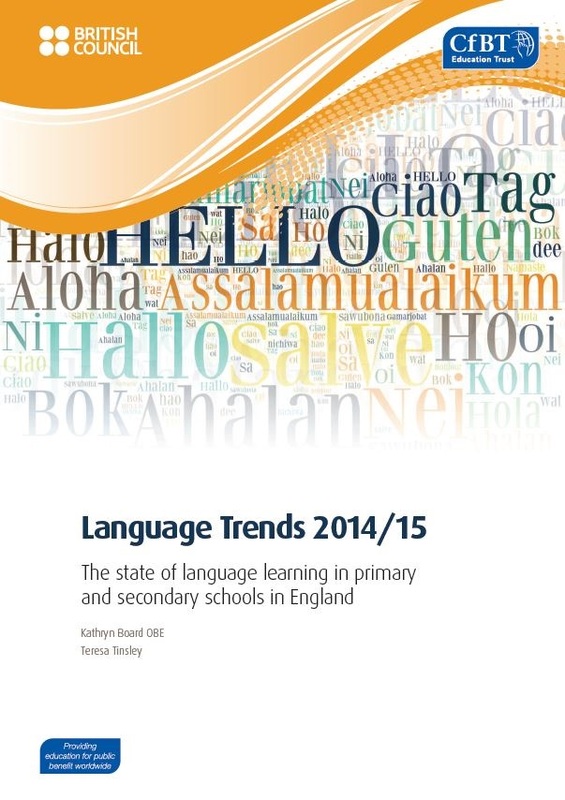 The growing tendency to exclude pupils from KS3 and KS4 languages, 3. The negative impact of external assessment systems and school performance measures, 4. The adverse effect of wider societal attitudes. We are grateful for the work done over several years by Helen Myers and Nick Mair on the issue of severe grading (point 3) as their findings have been acknowledged now. While you are on this website do look at the Changes ahead for MFL exams too, details of an excellent talk given by them and David Blow, the head teacher at Ashcombe School. You will find this very useful as you consider the new specifications. The authors hope that ‘the presentation of the key findings will facilitate productive discussion and debate’. René Koglbauer, the current president of ALL is very keen that we debate these findings. He wants to raise the profile of languages…’ with the looming General Election, our focus at ALL is fully directed on the various parties’ manifestos and their position towards education, teacher education and language learning.’ ALL supports the All-Party Parliamentary Group on Modern Languages Manifesto for Languages, please follow this link to the ALL website. Maintaining and developing UK expertise at higher education level. Have a look at the video on this link. René is encouraging us all to write to our local MPs about our concerns and ideas. How about joining in with the Speak to the Future’s campaign “Write to your MP” ? We are free to do this. If my Mum was still alive, I know that she would be reminding me how grateful I should be that we are free. In an interview in the Guardian recently, Miriam González Durántez shared that what she likes is the freedom of choice that we enjoy here. Last week we looked at the Guardian report ‘Living Languages‘. More thoughts on perspectives next week. While I eat a sandwich now, I’ll look for that book for my latest project, Mein großes Buch der Kunst. Ich sehe was du nicht siehst. Oh dear, there is one called Mein großes Buch der Farben. Ich sehe was du nicht siehst as well. I’m supposed to be tidying up, not adding to my book collection!